Summer Sales Reading List 2015: The Grand Finale! 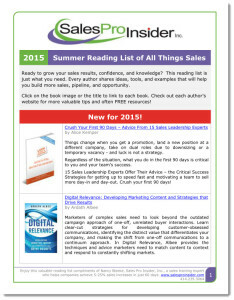 It’s Friday and the end of our posts on the BEST Sales books for your summer reading. It’s been found that only 25% of people over age 16 have not read a book in the last year. If you want to get ahead, continue to feed your mind with ideas, tools, and resources that can help you lead your team more effectively, hire better performers, and sell more, have we got the list for you! Pick 1-3 that you, or your sales team, can dig into with a cold drink in their hand and shades on their face. The increase in sales, engagement, and customer loyalty that follows will have you smiling through the winter that will arrive before we know it. I’d love to hear some more suggestions on books that have helped salespeople, but aren’t traditional “sales” books. I personally loved “The Power of Habit” – just understanding how we can change simple things in our routine to positively affect the outcome (for instance getting in the habit of sending an email confirmation for every meeting you schedule) can become habit, and bring success. 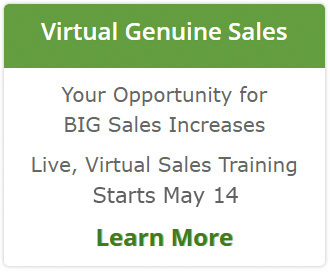 Any recommendations on other non-sales books for salespeople?